Your pediatrician is a great guy but he/she does not have the ability to diagnose or prevent vision problems. The quick screening they do is NOT a substitute for an eye exam. It is only done to be sure your child is not suddenly losing vision. 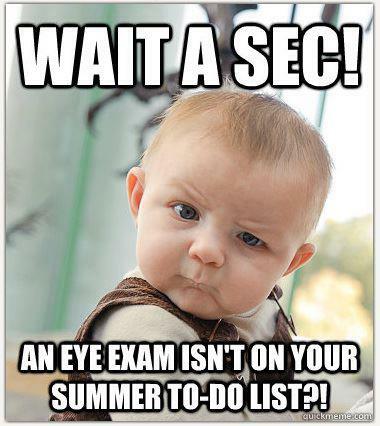 This is NOT even the beginning of an eye exam that your child needs! Most pediatricians today are in large medical groups where they are OBLIGATED to refer to ophthalmologists who are fantastic eye surgeons but not holistic doctors and do not offer Vision Therapy! None of them do vision therapy. Your child needs and exam by an optometrist who offers vision therapy. If not reading issues or underachievement can wreck your child’s self confidence and limit their future achievement. Every child over 5 needs to see an Optometrist, who like us, offers vision therapy (not a chain store doctor either as they almost never can do this). There are two of us that I am aware of in this county but lots more in nearby Ct and Westchester. If you live near us, bring your child and assure them a chance to be competitive and achieve at the level of their full potential! This entry was posted in Natural Treatments, Our View and tagged children, pediatric, pediatrician, scholastic achievement, school, vision therapy, vt. Bookmark the permalink.